On Grub Street, Lisa Borders says writing advice is like dieting advice: it sounds easy. "It sounds so easy! 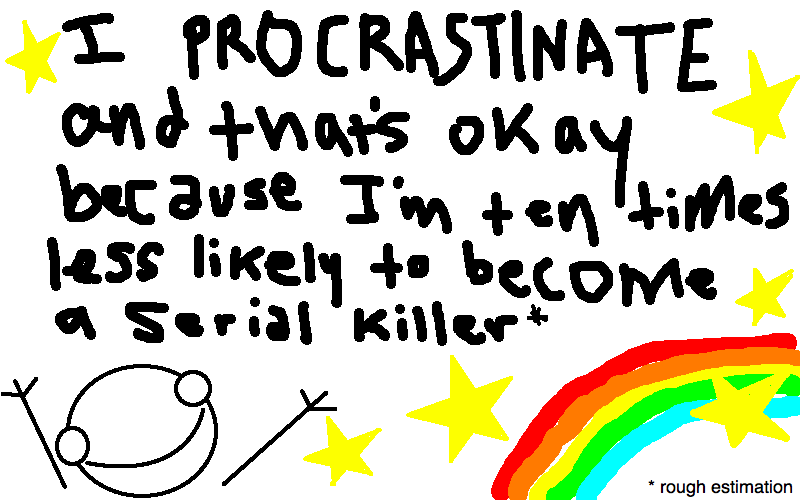 Just have that discipline, get up a couple of hours before you need to deal with the rest of your day, and write. This is the kind of advice often given to writers: early morning writing hours, daily word or page counts, stringent deadlines. It reminds me of nothing so much as the myriad diets I’ve been on over the years: the enforced exercise, obsessive point or calorie counting, weekly weight goals. "We all know what happens with most diets: we fail at them. And as we fail, we feel even worse about ourselves than we did when we began. "As with diets, I think this strict writing advice many of us take as gospel can lead to a similar negative feedback loop...."
Lisa Borders, "A personalized approach to productivity"
The poems are available online at http://www.ohiocenterforthebook.org/pocket. I've been posting shout-outs to the Cuyahoga County Public Library's National Poetry Month "30 Days of Poetry" site a lot in the blog, because they have been doing a great job of showcasing poetry from Cleveland and the surrounding area. But I just have to mention today's featured poet, though, simply from a purely self-promotional standpoint: today they feature a poem by me. And do make a point of checking out the "Read a poem" feature on the 30 Days of Poetry site: every day a new poet from Northeastern Ohio. I know of at least two poets in the area-- not counting myself-- who have taken up the gauntlet of the National Poetry Month "A Poem A Day" challenge. Come on, let's share! Post one of your challenge poems in the comments (or e-mail it to me), and I'll post it here. The Cuyahoga County Public Library's "30 Days of Poetry" has been doing an great job in showcasing poetry from Cleveland and the surrounding area (including quite a few who contribute to this blog.) I hope everybody's following along! Today's featured poet is worth a special note, though. In addition to being a poet, a teacher, and a tireless traveler, Michael Salinger has one other accomplishment that's worth highlighting here in particular: he started Clevelandpoetics: the blog. So, if you read this blog to catch up on what's going on in the poetry scene (or just to pass the time)-- thank Michael. And do make a point of checking out the "Read a poem" feature on the 30 Days of Poetry site: there are some amazing poets in the area. "Cicadas" by Michael Salinger in I Have My Own Song for It: Modern Poems of Ohio edited by Elton Glaser and William Greenway, Akron University Press, 2002. Used with permission of the author. Michael Salinger is a father, poet and educator who travels the world promoting the use of poetry as a literacy tool in classrooms. "Can you describe the mood of Cleveland as you feel/see it? "Cleveland is like being in the heart of a machine. I spent most of my life trying to leave. Growing up, I would have and did do anything to “get out.” It was like that place in a song; the place you get stuck in. Think Tracy Chapman. Gray and backwards, it was a place where people circled the wagons and resisted change. "I have been back now since the summer of 2012 after several years “away” in other cities. I have been across the world, and I now see how I was so very wrong about Cleveland...."
Crisis Chronicles Press published Sarah's newest chapbook, Every Bird, To You. Rereading and reexamining Tim Seibles's "An Open Letter," I'm caught by the line "What the hell happened to the notion of poet as town crier, rabble rouser, shaman, court jester, priestess, visionary, madman?" I'm wondering if, after attending a few open mikes, teaching a few classes and reading a few books from the library, poets haven't forgotten their responsibility. There seems to be an aesthetic of "clever" that permeates a lot of poetry today--poetry that says little, but works on some level as a joke or entertainment. While this may work to sell poems, and appeal to a wide audience, I'm wondering if it doesn't detract from the purpose of poetry as a whole. I'd like to urge poets to consider the responsibilities they have to their readers and to their communities as a whole, and challenge them to take up the mantles that Seibles calls for. despised poems./It is difficult/to get the news from poems/yet men die miserably every day/for lack/of what is found there." Where are the poems that men are dying for the lack of? Why aren't we writing these poems? A rabble rouser is one who excites or inflames a group of people into action, who appeals to the emotions and values of the group to spur them into acting. What is important about a rabble rouser is that they appeal to the EMOTION of the people via rhetoric, not the LOGIC of the people. Where are the poems and poets that are appealing to our emotions, that spur us into action? Where are the poems that challenge and usurp the ochlagogues that permeate our televisions and radios? A shaman is a religious figure that reaches altered states of consciousness through ritual to enter the spirit world. There, they deal with spirits, both good and bad, and channel these energies and messages back into this realm. Often these messages are those of healing or prosperity, the shaman having been asked to deal with a specific illness or malevolence plaguing an individual or the tribe in general. Our world is faced with so much suffering, so where are the poems of healing? Jerome Rothenberg's anthology, Technicians of the Sacred, is filled with poems from shamans. What can we, as poets, learn from these ancient texts? Traditionally, there are two types of jesters or fools: the natural fool and the licensed fool. Natural fools were those who, through some illness or ailment, would act inappropriately. According to Allison Chaney, "The fool's status was one of privilege within a royal or noble household. His folly could be regarded as the raving of a madman but was often deemed to be divinely inspired. The 'natural' fool was touched by God." The licensed fools were trained individuals who were given leeway by their master to act in such a way. In the case of the licensed fool, their role was not merely entertainment, but one of critic. In either case, the jester operated outside of the bounds of society's rules and regulations, and their words were seen not as madness, but as wisdom. Often speaking in riddles, the fool criticized the prevailing social order and challenged status quo. So where are our poems that work as riddles to challenge and critique? How can we use divinely inspired madness to work outside the social order and challenge it's foundations? If the Court Jester can be seen as "The Fool," the first unumbered card of the major arcana, then the High Priestess is the third card, numbered as "2". She is seen as a visual representation of Shekhinah, or the female embodiment of the Divine. Interpretations vary, but often she represents a secret being revealed, often through wisdom, sound judgement or common sense, or even intuition. Where, then, are the poems that split open the secrets which are being kept, which reveal the truth through common sense and wisdom for the reader? A visionary is one who has visions. Often these are visions of events to come, or the future. Mystical poets and prophets probably fall under the heading of "visionary." There is even a style of art called "visionary art" that purports to "transcend the physical world and portray a wider vision of awareness including spiritual or mystical themes, or is based in such experiences." If there can be such a thing as visionary art, then why not visionary poetry? In his poem "America," Allen Ginsberg writes " I have mystical visions and cosmic vibrations." Where are the poems of vision, of the future? Where are the poems that prophecy? d. a. levy, in "The Cleveland Manifesto of Poetry," writes that poets should "create new myths, madness and mass from the contemporary waste of intellectual energy." Madness is associated with the insane, but how is that insanity defined? 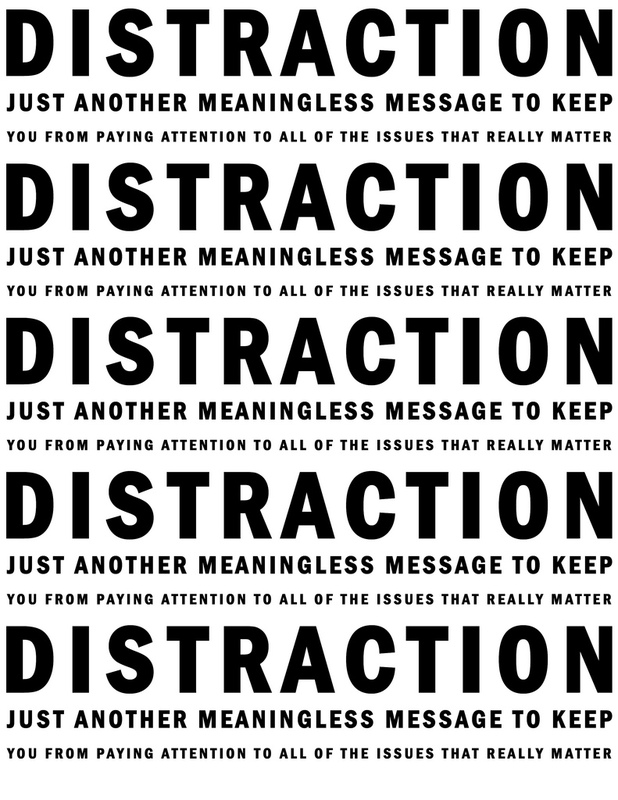 Folks with diseases--clinical depression, bi-polar disorder, anxiety disorder, schizophrenia, etc.--are all seen as unwell, mentally and emotionally, by the status quo. While we have visions of madmen struggling against their straitjackets, locked in padded cells and frothing at the mouth, all too often madness is simply seeing the world in a new or unique way, a way that challenges the status quo so thoroughly that it is seen as threatening. Where are the voices, then, that rise up from what levy sees as "the contemporary waste of intellectual energy" and, through their madness, bring about change for the reader? It is no longer enough to be safe. Is is no longer enough to be cute or clever. Readers thirst for a poetry that will revitalize and rejuvenate them, not merely fill them for the moment. We poets can no longer be stand up comedians, entertaining our readers with the literary equivalent of Twinkies. We can no longer gaze at our navels and expect that the drudgery of our lives will be so profound as to shake a reader from their own drudgery. We must be better before we fade into oblivion completely. Being pretentious, dreary and inscrutable—all at the same time—is a lot of hard work. These two local poets take the easy way out. Despite their education, these veteran schoolteachers prefer to write sweet, breezy verses that can be appreciated by anyone with an ear for a well-turned phrase and a feeling for the beautiful little twists and turns of life. Joe, who claims to have roller-skated from Minneapolis to Cleveland, also claims to have read poetry with Dan at the Shaker Library’s Poetry in the Woods program for the last ten years. “We’d like to bring our poetry to Lakewood so that our west side friends can scratch their heads with the same vigor as our east side friends.” Dan, a former English teacher, former magazine editor and former employee of a surprising number of defunct bookstores, is the proud author of a series of breathtaking, unpublished novels. While both are known for making even the hardest-hearted critics of poetry crack a smile, Dan specializes in the linguistically astonishing as Joe gives himself over to the absurd. Bobbleheads of Ovid will be given away to the first fifty audience members who realize that this is a joke and that there will be no free giveaways. Poems are nothing more than songs. Songs are simply poems sung. These simple truths form the essence of Herbert Woodward Martin’s beliefs and craft. Martin is perhaps best known as a scholar and performer of the pioneering African American poet Paul Laurence Dunbar’s works— performances that he’s taken as far west as Chaminade University in Hawaii and as far east as The Alexandrine Library in Egypt. He's also the celebrated author of eight volumes of poetry. In this program, Martin will both demystify verse and praise its virtues. First, he will give an impromptu demonstration of how to write a poem using words supplied by the audience. Then he will discuss the legacy of the Dayton born Paul Laurence Dunbar. Dunbar only lived thirty-three short years, barely glimpsing the dawn of the twentieth century, but his verses have proved enormously influential. Martin will perform some of these pieces, blurring the line between recitation and full-throated song. Any skeptics who might be in the audience will have the dust blown off their preconceptions when they are confronted by the power, rhythm and humanity contained in a sequence of mere words, read with conviction and unabashed reverence. This is a program that you simply must witness. Books will be available for sale and signing at the event. Sohrab Sepehri was born in 1928 on a journey between Kashan, his family's home, and Qum. An acclaimed painter, Sepehri published eight books of poetry during his lifetime and traveled widely throughout the world, including Europe, South Asia, the Middle East, China and Japan, the United States and South America. Many of his poems were influenced by his relationship with nature and his studies of Eastern philosophy and visual arts. They were often composed in a cadence similar to spoken language, considered a radical innovation at the time. Sepehri died in 1980 and in Iran is considered to be one of the most important poets of the twentieth century. Pierre Joris described Sepheri as, “a modernist Muslim for whom the black stone of the Kaaba was the sunlight in the flowers. He tried to invent a world in poetry and a poetry in the world as had not been seen since the Nishapur of Omar Khayyam. He made it new, indeed—writing a poetry that is a geometry of breath from which music grows, with its cargo of light.” Mohammad Jafar Mahallati, one of Sepheri’s English translators, is currently Presidential Scholar in Islamic Studies at Oberlin College. He served as Iran's ambassador to the United Nations from 1987 to 1989 and successfully negotiated a peace agreement to end the war between Iran and Iraq. His scholarship has focused on Islamic and Sufi poetry and most recently on the philosophy of friendship. Books will be available for sale and signing at the event. In this debut collection, named winner of the Ohioana Book Prize in 2012, Dave Lucas turns and returns to Cleveland. The weather he writes about arises from the lush light of the natural world and the hard rain of industry. Poem by poem, Lucas surveys the majesty and ruin of landscape and lakefront, paying tribute to the shifting seasons of a city, of a terrain, and of those who dwell there. “I love our weather. There's always a moment in the winter when I'm sick of it and a moment sooner in the summer. But I love the steel look to the sky in winter. It makes our few days of crystal blue in spring and fall all the more worthwhile. I use the word weather as a verb. This city is weathering the storm. The town has been beaten down, but many Clevelanders take that as a point of pride. Like the coffee mugs say, ‘Cleveland: You gotta be tough.’” Books will be available for sale and signing at the event. Explore your own life journey through poetry in this four-week program presented by Case Western Reserve University. The roads upon which you've traveled are marked by steps still to be taken. Rabbi Enid Lader will lead a discussion of poetry and song that beckons us to reflect on what it means to think of our lives as a journey and how the text of our lives reflects our values. We will explore the questions of what we want to pass on to the next generation and what is in store for us in the future. Rabbi Enid C. Lader has served the Beth Israel -The West Temple congregation since August, 2012. Active in the Educational Director's Network, Enid also served in various capacities on the regional board for the Union of American Hebrew Congregations (now the Union for Reform Judaism) and has taught the west side Taste of Judaism and Feast of Judaism classes for the Jewish Education Center of Cleveland for over twelve years. 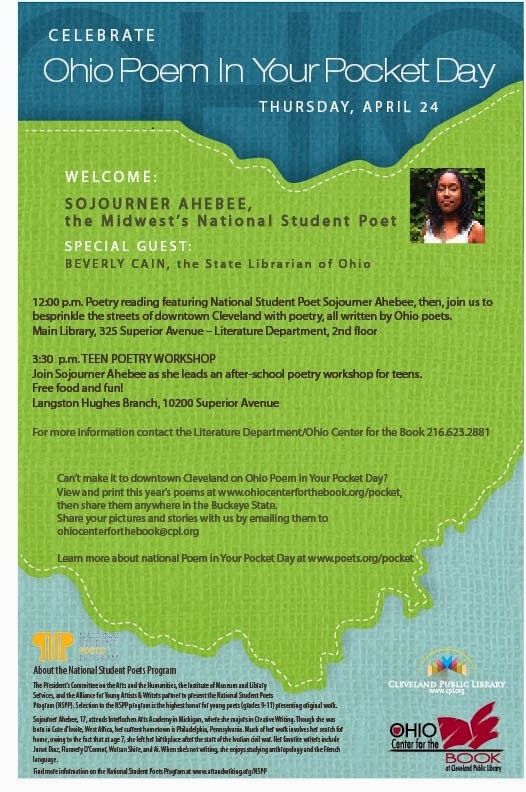 The clevelandpoetics blog got a shout-out in Sunday's "30 Days of Poetry" from the Cuyhoga County Public library. Thanks, CCPL! I recently met Robert Coughlin at the poetry series Words and Wine in Painesville, Ohio. 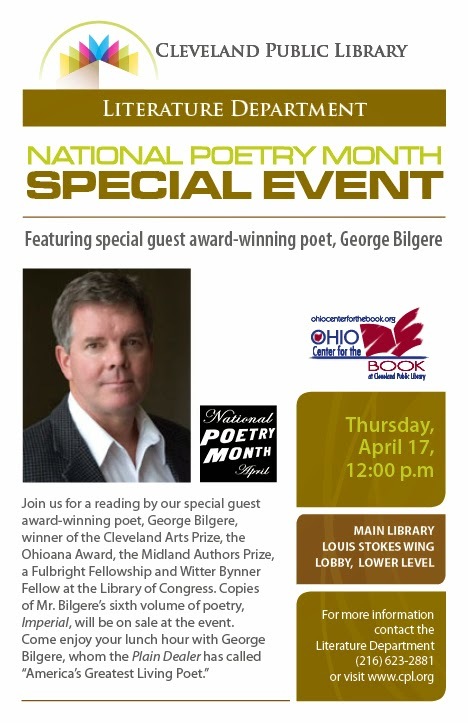 He and series emcee Margie DeLong have asked me to get the word out about this poetry competition. · There will be a $5.00 fee with your entry, payable to Lakeland Community College. · Submissions will be accepted until Friday, April 18, 2014. · Prizes and certificates will be presented at the awards ceremony at the Lakeland Library, C-3051, 7:00 p.m., on Tuesday, May 6, 2014. · Winners will be invited to read their work at the awards ceremony. · Winning poems will be published, with your permission, on the internet. 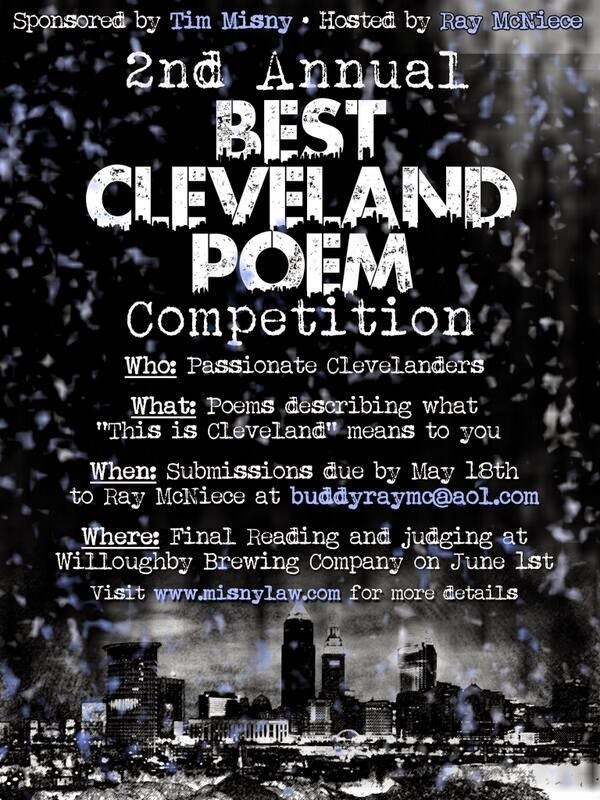 Each entrant will submit 1 to 3 poems to one category. No single poem should be longer than 2 typed pages. Entrants should include a separate sheet with name, address, phone, category, and titles of the poems. No personal information should appear on the poems themselves. Manuscripts will be returned if entrants supply a self-addressed stamped envelope. The competition is not open to Lakeland employees, but family members are welcome to submit. On February 28, 2004, poet Tim Seibles penned "An Open Letter," a rant and call to arms for poets everywhere. He ends with this: "I pray that those with the necessary instruments will soon bring the right noise." While not explicit, I've always seen this as a possible allusion to Public Enemy's 1987 single "Bring the Noise" which later appeared on their album It Takes A Nation of Millions to Hold Us Back. Much has been written about rap as poetry ("Bring the Noise" stands as an excellent example of dactylic meter and is rich with rhyme, allusion, and imagery), and I do not wish to pursue that topic. What interests me is the alternative--poetry as rap. Many MCs refer to themselves as poets, or refer to their lyrics as poetry, but very few of them come from a background of poetry first, and I'm wondering if this wouldn't help revitalize both poetry and the hip-hop community, and help to bring poetry to a wider audience. The obvious precursors are performance poets, specifically those of the 1960s (The Last Poets, Gil Scott-Heron), who infused poetry with music on albums that sold quite well. Other examples include NuYo Records/Mouth Almighty run by Bob Holman in the 1990s. However, these examples are few and far between, and more often than not, the Grammy category of "Spoken Word" is bereft of poetry in its nominations. The first, and most obvious argument is that "poetry doesn't sell." Labels don't put out poetry CDs because poets aren't famous enough to sell them, which leads to a dearth of options for the consumer public. I question this argument because CD (and now mp3 and other digital formats) have become so easy that anyone with access to a decent computer can put together a few tracks. The other argument, and one that I think bears some merit, is one of promotion. Poets are notoriously poor at promoting themselves and their art. Famous for it, even. While albums and books often have media campaigns--advertising, videos, etc.--poets and poetry seem to relegate themselves to live sales only. Beyond gigs at coffee shops and bookstores, and possibly a facebook announcement or similar, we do very little to promote ourselves in the way that other artists, specifically musicians, do. While his album The Death of Willie Lynch would probably be ignored as spoken word and seen as rap, it does show the potential that poetry can have to reach a wider audience than simply those who are used to coming to poetry readings. At the beginning of National Poetry Month, I am caught up by the wave of poets and the flurry of activity on social media focused on poetry. Libraries are offering poetry programs, poets are offering "poem a day" challenges, and poets are filling their blogs and Facebook pages with new work. This is exciting, to be sure, and I would hope that this energy continues beyond April, but I constantly find myself wondering if it's getting to the right audience. How can we take this energy and this work, and bring it to the wider public? What can we learn from other genres, such as rap, in terms of marketing and promotion? What are your thoughts? The Cuyahoga County Public Library's National Poetry Month "Read + Write: 30 Days of Poetry" is now live! No fooling! Sign up to receive their daily National Poetry Month emails, sending you creative writing exercises and poems "to inspire you and unleash your creative spark," with a special focus on the poets and poetry of Northeast Ohio. It's worth checking out. Sign up, or just bookmark their page, but be sure to check for something new every day for the next thirty days. Meanwhile, the Lakewood library will also be featuring readings and events. Stay tuned for more info, but as a starter, at 7 pm today, the Lakewood library will celebrate a new posthumous collection of the works of Kent poet and bartender Mort Krahling. Maj Ragain, Brooke Horvath and Larry Smith will be among those joining the celebration of this rare, self-contained man. More at the Lakewood library web page. Farther away from Cleveland, over at the "Poetic Asides" page on the Writer's Digest blog, Robert Brewer has the 7th annual April PAD (Poem-A-Day) Challenge: 30 days, 30 prompts. For this year's challenge, the top poem for each day's prompt will be published in a slick anthology, selected by an all-star cast of guest judges, including Thomas Lux, Barbara Hamby, Bob Hicok, Traci Brimhall, Jericho Brown, Sandra Beasley, Amy King, and more than 20 others. Find each day's prompt on the Poetic Asides home page.